On a daily basis, people in the 19th century used tools to perform their chores. Read the following diary entries to get a sense of the types of chores people did on New England farms. “When a boy has to carry all of the water by hand, a pail in each hand, he can vividly realize the difference between ‘washing days’ and ‘baking days’ and just common days.” Indeed, the swapping of works by the farmers in haying time was a bit of adventure to an ambitious boy. He moved at least one farm away. He had one or more new boys with which to joke and work. He had new kinds of food at dinner time. He had a new set of rocks to work around, and new fields to mow and rake, and new barns to fill. It was almost all different, and while it was work, and hard work, it was a change. What flying across the Atlantic was to Lindbergh... changing works was to the farmer boys. “1835. [Apr.] 7th. Finished cleaning the old house for the present, have been to work on it for three weeks, have just got it comfortable to live in. 12 Sun. For the first time my wife went to meeting with me. 13th. Mended fence some, brought water some, run after the sheep and geese some, and did other chores. May 6. Paid Charles Clapp 23 dollars for the stove. Isabel came to make me a visit, the first time she was ever in my house - my house - and have I a house of my own? Yes, I am a slave to no one but myself now. Jun 3. Sheared sheep for Capt. Dutton. 15th. Worked on the road; my tax this year is almost six dollars. Aug. 25th I threshed Indian whet. 26th. Cleaned up the buckwheat and threshed 2 bushels of Rye. Sept. 2 Went to tunbridge with [wife] Charlotte. 19th. [Militia] training, met at Mr. Fox’s. 22nd. Went to father’s, he and mother were gone a visiting so we children visited together. 23rd. Cut and bound corn. [Nov.] 17th Set out apple trees. 21st. Finished ploughing the wheat stubble. [Dec.] 16th. The coldest day I ever saw. What can we learn about daily life on a New England farm by analyzing the tools that women, children, and men used? What did people leave behind as evidence to their lives? Sort the General Tools Cards into two piles, one for objects used in the barn or field and the other for objects used in the house. Try to figure out who was most likely to have used each of the tools; a man, a woman, or a child. Create a chart to document your ideas. Create a diary entry from the point of view of a man, woman, or child. Comment on the chores you have accomplished today. Make sure to include at least four tools and what your character would have done with the tools. 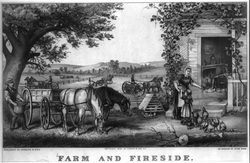 How does the New England farming lifestyle of the 19th century compare with your modern-day life? What do you think you would like or dislike about that lifestyle?